Aerial Waves are your local TV aerial, digital and experts. Local to West Yorkshire that is. We’re a family run business, and are based in Halifax, Calderdale, serving many happy customers in West Yorkshire and beyond. If you’re looking for a reliable company that prides itself in delivering the best in customer service give us a call! Based in Halifax just down the road from Bradford and Huddersfield. We also serve Leeds and Wakefield. If you require a new TV aerial or a professional technician to install Sky Digital, Freeview or Freesat, Aerial Waves can help you. Our staff can also wall mount your TV or install any bespoke commercial TV system for your business in a professional and efficient manner and at a reasonable price. Aerial Waves (Halifax) has been helping TV customers for over a decade. There isn’t anything we don’t know about fitting aerials and digital TV, so when you call us you can be assured that you’ll get qualified, experienced engineers who know exactly what they are talking about. Each of our technicians is trained and accredited and carry identification for our customer’s security and are certified to work at any height. In addition to keeping our prices as competitive as possible, we are also able to offer the same day service to all residents in Halifax, Leeds, Bradford and around West Yorkshire. Once our jobs are completed, we provide our customers with a two-year labour guarantee and we offer lifetime telephone support for your peace of mind. If this sounds like what you are looking for, please call us today on 01422 353015 and we’ll be able to help you right away. You can also keep reading to find out more about the services we offer, how they can benefit you and why you should use Aerial Waves (Halifax) four next TV aerial, satellite or digital television job. A decade ago, the UK switched off all of its analogue channels and made the transition to all-digital TV broadcasting. This meant that thousands of UK households had to have a digital TV aerial installed and now they will need to be replaced or repaired. We offer a great value service and a low-cost for Halifax TV aerial replacements. All our work is also covered by a 12-month warranty, so we can come out immediately to service anything we install as required. We can provide TV aerial replacement in Leeds, Halifax, Bradford and Huddersfield or any location in West Yorkshire. TV aerials in Halifax can be replaced quickly and on a budget, so you won’t be without your beloved telly for long. Our expert team of digital TV installers have decades of experience fitting TV aerials in Halifax and are happy to help with whatever situation you find yourself in. Many people think that if your TV aerial is broken then the whole unit has to be replaced, but there are solutions where only a few parts need to be replaced in some cases. All our work is also covered by a 12-month warranty, so we can come out immediately to service anything we install as required. We can provide TV aerial replacement in Leeds, Halifax, Bradford and Huddersfield or any location in West Yorkshire. Freesat is slightly different from normal digital TV as it requires a satellite to be installed. It gives you much more channels, including HD ones for major channels, as well as local ones. The main advantage of Freesat over standard digital TV is that you can get it wherever you live. Aerial Waves (Halifax) offers satellite installation in Leeds, Halifax and Bradford or any location in West Yorkshire. Many people think that if your TV aerial is broken then the whole unit has to be replaced, but there are solutions where only a few parts need to be replaced in some cases. All our work is also covered by a 12-month warranty, so we can come out immediately to service anything we install as required. With over a decade of experience and the best reputation in Halifax, we are one of the most trusted aerial installation firms in the area. Do you need a new digital TV aerial? Do you need any repairs or maintenance on your existing digital TV aerial? Does your aerial need a service check? If so, Aerial Waves (Halifax) can help you! If you have been affected by the digital switchover and need a digital aerial to continue receiving your favourite channels, then get in touch with us today. We are available to come round at a time that suits you and carry out a full survey and answering any questions that you may have. We can then provide you with a free written quotation and if you are happy with the cost, we are able to install your new digital aerial including all fittings, brackets and equipment on the same day while we’re at your house. However, if this is inconvenient we can come back on a time and day that suits you. If you are looking for a traditional roof installation or would like an aerial installed in your roof, please contact us today. Our expert technicians specialise in the discreet aerial installation and are master at hiding cabling in cavities and voids in your home’s flooring and walls. We are able to offer this service anywhere in Halifax, Leeds, Bradford, Huddersfield and other locations in West Yorkshire. Aerial Waves (Halifax) also specialises in TV aerial repairs and maintenance. This means that whether your aerial needs a service check or it has simply stopped working we can help you, so get in touch with us today and we will be out to help you as soon as we can. In many cases, this can be the same day as the request has been made to us. Aerial Waves (Halifax) is a family business that is well-known for its exceptional service and we maintain this promise for all of our customers. No matter where you are, you will always receive the same high quality of service and attention to detail as all of our clients. Everyone will benefit from our experienced staff’s knowledge and trustworthiness, whether it be installing Sky Digital, Freeview or Freesat. Sky Digital is renowned for its excellent choice of channels and shows that will entertain the whole family. It has hundreds of channels that are dedicated to every niche, including sports, movies, documentaries, news and kid’s entertainment, there is truly something for everyone to watch. Aerial Waves (Halifax) is able to provide the same level of quality hardware and installation experience as Sky’s own technicians. We can provide an outstanding range of set-top boxes and satellite dishes that are available to suit every budget. Additionally, we can help arrange your chosen packages of Sky channels. If you are in the market for an upgrade to Sky Digital, please get in touch by calling 01422 353015 today for a free quote. Unlike many of the specialist TV and aerial installation companies in Halifax, each of our technicians is certified and accredited by appropriate bodies. Our staff will always arrive in full uniform and carrying identification and we promise to deliver on time and negate any challenges that may occur. If you have recently bought a new LCD, Plasma or 3D TV, you will surely want it to be the pride of your living room. Or maybe you have bought a new TV for your home cinema. You may even have bought a flat screen TV for your man cave or kid’s bedroom. In addition to installing TV aerials and satellite packages, we are also able to provide wall-mounting for your new TV. Our wall mounting solutions are perfect no matter how big your flat screen TV is. We can also supply tilting brackets that are great for customers who need their TV to be in a tilted position or even articulated arms to give you maximum flexibility for your new TV. We can mount your TV in any room, from your lounge to your kitchen or bedroom. We are also happy to discreetly hide cables and will position your TV at the perfect viewing location. This, of course, is also offered as a same day service and our prices are very reasonable. Please get in touch today on 01422 353015 for your free TV wall mounting quote! Digital aerial and Sky Digital installation are not the only services we offer; we also specialise in Freeview installation. At Aerial Waves (Halifax), we keep up to date with the latest digital technology, meaning our technicians complete regular training in new digital TV systems and installation techniques. Our customers benefit from this continuous knowledge growth by receiving the best advice and installation every time. Freeview is an excellent digital TV service that offers dozens of great TV channels with no monthly subscription cost. Customers can access a range of free-to-view digital services through a TV aerial and set-top box without having to pay any direct debit charges. If you are new to digital TV and you want to make the most of it, please call 01422 353015 and one of our technicians will be happy to help you. We can supply you with the best quality aerial, so you receive your favourite digital TV channels in the best quality. We will also be able to provide you with a choice of the best Freeview set-top boxes available and promise to show you and your family how you can get the most out of your Freeview system. 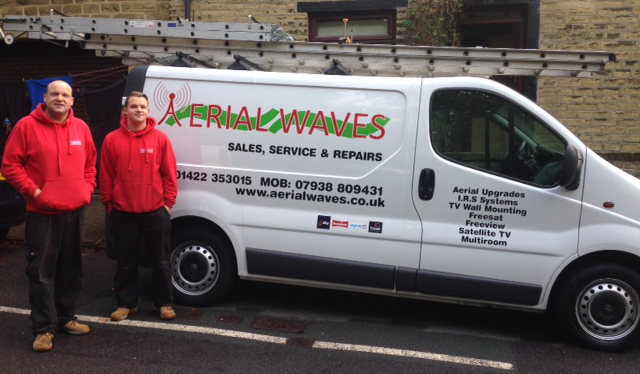 For the past decade, Aerial Waves (Halifax) has been providing a professional, dedicated and affordable service to customers across Halifax, Leeds, Bradford, Huddersfield and the rest of West Yorkshire. Why don’t you join the thousands of satisfied customers by booking your Freeview installation today by calling 01422 353015? If Freeview doesn’t have enough channels for you but you don’t want to pay for a Sky Digital subscription, Freesat may be the answer for you. It has no monthly subscription and over 140 entertainment and news channels, making it a popular choice for homeowners. Its on-screen TV guide allows you to plan your TV viewing for up to eight days in advance, so you’ll never be stuck for something to watch. Freesat also has the advantage of coming with a High Definition option, which is perfect if you have an HD television and want to watch all of your favourite TV channels in superb HD quality. There is also the option to choose Freesat Plus which features similar to Sky+ like pausing, recording and rewinding live TV. Additionally, your Freesat Plus box will allow you to record and store up to 300 hours of television programmes and movies in standard definition or up to 80 hours when recorded in HD. If you want to be able to catch up with your favourite TV shows whenever you want, then Freesat Plus is the service for you. Aerial Waves (Halifax) are specialists in the installation of Freesat. Our technicians can talk you through the various Freesat options that are available to you, install your digital TV aerial and even show you how to make the most of your Freesat set-top box and it won’t cost you the earth with our affordable prices. Find out more today by calling 01422 353015. If you require a company that specialises in commercial TV systems, then Aerial Waves (Halifax) can help you! We have a long and well-earned reputation for providing advice for commercial TV systems and we can even design and install bespoke solutions for you. We will work directly with you to decide on the best plan of action and tailor a commercial TV installation solution to your needs. Our trained and accredited technicians will complete the installation with minimum stress for you. Aerial Waves (Halifax) has been TV, aerial and digital TV specialists for over a decade, so you can trust us to find the best system for you at the right price. We also offer a two-year labour guarantee along with free lifetime telephone support to ensure we are always available when something goes wrong. Our commercial TV systems are designed specifically for your business and are fitted by our professional technicians and backed up with our guarantee for your peace of mind. Can any other company offer that? Find out more about our services by calling us today on 01422 353015.